Our Adoption Journey: Too Good to be True? 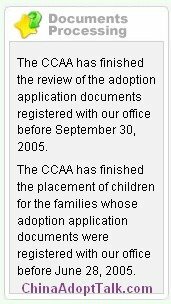 First thing this morning I checked the CCAA website and found that they have matched families with paperwork sent to their office before June 28, 2005. While our agency never seems to get the referrals as quick as all the other larger agencies get them this COULD mean our referrals are on their way soon. I do hope we will see Sophia's face before the end of this month.